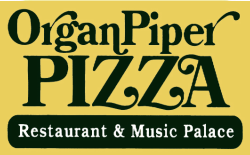 Organ Piper Pizza has been a Milwaukee area landmark for over 40 years, opening in December 1976! Our main dining focus is our highly rated thin crust pizza along with sandwiches and other delicious foods. It also takes a special talent to play a "Theatre Organ", and we have strived to have the country's finest organists to entertain you! Please feel free to check out our website, but remember, only a first hand visit will fully demonstrate the audible and visual experience that makes this a restaurant you cannot miss! Visiting us for the first time? Visit our FAQ page! All other days, our regular hours can be found here! Like and Follow us on Facebook and Instagram to stay up to date with current events and specials! Visit our Gift Shop for music from the Organ Piper Wurlitzer! !